Police block convoy of Nigeria’s Senate president as some APC senator defect to PDP – Royal Times of Nigeria. Policemen in the early hours of Tuesday blocked the convoy of the President of the Senate, Bukola Saraki at Lake Chad Junction, Maitama, Abuja. The move as gathered may not be unconnected with invitation letter sent to Senator Saraki by the Nigeria Police Force asking him to appear before investigators in Abuja today. 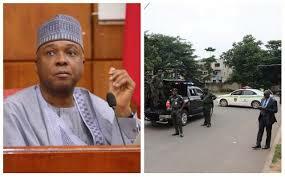 Meanwhile, the Nigeria Police Force (NPF) earlier today said it is not aware on the siege laid on the residence of the President of the Senate, Bukola Saraki by security agencies. The spokesman of the Police Force, DCP Jimoh Moshood who stated this said he is not aware of the development.